Also alumni of Cardiff University School of Engineering, Chris graduated in 2010 with a degree in Civil and Environmental Engineering. Knowing that he wanted to commit himself to renewable technology, Greenleaf Innovations Ltd was formed. Since forming the company Chris has continued his education by obtaining both trade qualifications (ground source heat pumps installation, unvented cylinders, general plumbing, electrical installations, Solar Photovoltaics and electrical inspection and testing) and further professional qualifications. In 2012 he attended the challenging CEPH (Certified European Passivhaus De-signer) course at BRE in Watford and intends to be a qualified designer to a worldwide standard for Passivhaus in 2014. To complement the extraordinary levels of quality management required to deliver successful Passivhaus projects Chris is also undertaking the Prince2 qualification in Project Management. 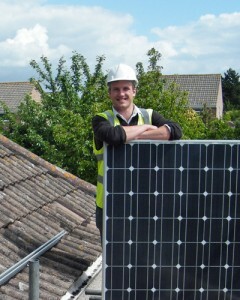 Chris is GIL’s renewable energy expert and as such is the qualified MCS supervisor for the company. He has developed GIL’s Quality Management System to exceed MCS requirements and has ensured that the company was certified first time with no non conformities by the accreditation bodies that GIL has worked with (BRE and Benchmark). In addition, Chris has turned his knowledge to furthering developing technologies. Working with UWE and various partner companies as a Solar industry partner, Chris has led consortiums to win INET research funding and been the industry expert to access TSB project development funding. Chris has many ideas for how to develop renewable energy further and firmly believes in the company adage of ‘Renewable Energy for All!’ In addition Chris led a consortium bid between Architects and Engineers to the semi finals in the Vanke House competition with the BRE, a collaborative knowledge exchange project between China and the UK. However, following discussions with Vanke representatives the consortium agreed that the benefits of the project were of limited benefit compared to the investment required. In addition to GIL, Chris is involved in two other companies. He runs Pure Chaos Agility with his Wife, Charlotte, from the family farm near Westerleigh and is currently developing a social enterprise with the charity Props which aims to provide vocational education and skills for young people with learning difficulties in the South Gloucestershire and Bristol regions. Chris is a corporate member of the Society of Environmental Engineers and will be applying for Chartered Environmentalist status with SocEnv in 2015.